The government shipping agency Friendly Islands Shipping Agency is investigating claims that passengers on Niuatoputapu were made to board the MV ‘Otuanga’ofa at night time and while there were huge waves. The claims were made by the former Member of Parliament for the Niuas, Lepolo Taunisila. Taunisila made the claims on Facebook based on an account of the incident she received from her brother, who travelled on the vessels from Niua to Tongatapu. 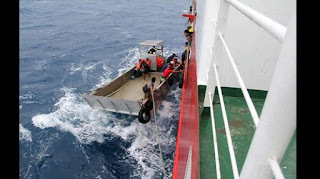 Taunisila said heavy rain fell while the vessel was loading and passengers were told to climb and enter through a side door as the main entrance could not be opened because of the severe weather. Passengers had to be loaded into small boats before they were transferred to the vessel, which was heaving in the open sea. Women and school children were wet and ropes were stretched out to help them get into the vessel. Some passengers’ cargo fell into the sea, Taunisila said. A FISA spokesperson told Kaniva News he only learned about the claims after he was asked to comment. Taunisila questioned the decision by the vessel’s master to load the passengers at night as it was clear from the beginning the sea was rough. She said it would have been better to load the passengers during the day. “How about if the load of the passengers were postponed to the following day until the weather was fine?” Taunisila asked. She claimed this was a clear sign there was no improvement in FISA’s poor services. She said she was concerned about “the lives of our poor people”. Taunisila called on the government to dredge the Niua wharf so that the vessel could enter it. In March last year Kaniva News reported that inter-island ferries in Tonga were still travelling to Niua Toputapu despite the fact that signal and beacon lights damaged in the 2009 tsunami had not been repaired. At the time FISA CEO Mosese Fakatou said the Marine Department said they had no money to fix the eight year old damage. Sediment from the tsunami has filled the channel to the wharf in Pasivūlangi harbour so the ferry was navigating a shallow passage. The MV ʻOtuangaʻofa once ran aground while navigating its way out of the harbour.